Diamond drilling on GGX Gold’s Gold Drop property near Greenwood, southern British Columbia. 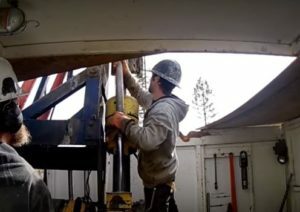 Source: GGX Gold Corp.
Ximen Mining Corp. [XIM-TSXV; XXMMF-OTCQB; 1XM-FSE] said Friday April 5 that it has picked up additional mineral claims near Greenwood, southeast British Columbia. The company said it has acquired over 12,900 hectares of land that surrounds the Gold Drop property which Ximen has optioned to GGX Gold Corp. [GGX-TSXV; GGXXF-OTC; 3SR2-FSE]. The property also adjoins a large swath of land to the south and east that is being explored by Kinross Gold Corp. [K-TSX; KGC-NYSE]. Ximen said it acquired the land package, (consisting of 17 mineral tenures and known as the Providence claim) by means of a direct purchase and additional staking. Ximen shares advanced on the news, rising 10.14% or $0.07 to 76 cents. That’s up from 53 cents on March 29. The shares are trading in a range of 13.5 cents and 86 cents. The Gold Drop property is subject to an option agreement between GGX and Ximen Mining, dated June 2016. Under the agreement, GGX gained the right to acquire a 100% interest by making payments of cash and shares to Ximen over a four-year period, and committing to spending $1 million on exploration. Under the deal, Ximen retained a 2.5% net smelter return royalty, but granted GGX the option to purchase 1% of the royalty for a payment of $1 million. Ximen also retained the right to form a joint venture with GGX by reimbursing GGX for 30% of the total amount spent on the property. The Gold Drop Project is located 40 km from Grand Forks in geologically prospective ground in the well mineralized Greenwood District. The project covers 5,600 hectares and was mined intermittently from 1919 to the 1980s, producing 7,572 tonnes from three veins (Amandy, North Star and Gold Drop). Most of the production occurred before 1942. GGX Gold completed 71 diamond drill holes on the C.O.D. vein in 2018. Highlights of the program included two holes that intercepted 107.5 g/t gold and 880 g/t silver over 6.90 metres core length, and 129 g/t gold and 1,154 g/t silver over a 7.28-metre core length. In addition to drilling this year, GGX has said it intends to establish small scale production, using hopper/feeder module which can run at four tonnes per hour. A prospecting program in 2017 located the historical COD mineshaft and several new vein exposures. Drilling and trenching during the 2017 and 2018 exploration seasons has led to the discovery of significant gold-bearing structures which are prevalent throughout the property, including the COD and Everest veins, the company has said. Ximen said its field crew recently carried out an initial site visit to the Providence claim. The program was designed to locate and sample historical workings. One sample from an unnamed mine dump returned significant gold and silver values of 2.87 g/t gold and 127 g/t silver. The find is located northeast of the historic Providence mine. Several previously un-documented exploration pits were also discovered, which exposed massive sulphide material containing chalcopyrite, bornite, and magnetite. The sample returned values of 2,350 ppm copper and 3.4 ppm silver.